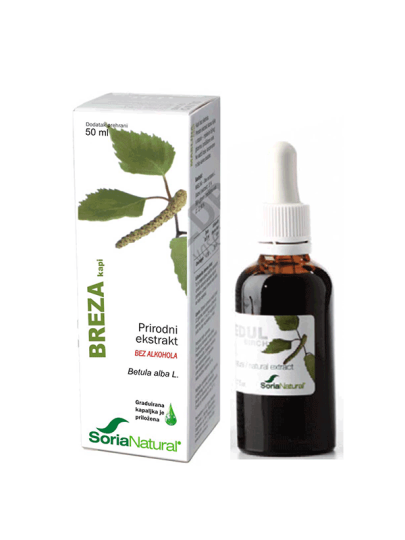 Soria Natural Breeze (Betula alba L) is a natural extract of leaves innonalcoholic solution - a mixture of vegetable glycerin and purified water. Non-alcoholic tincture is also suitable for children, liver patients and others. It does not contain any colorants, preservatives or other additives. Breeze inhibits inflammation, acts as a stimulant, promotes water excretion (diuretic) and increases urine production, relieves fever and reduces fever, causes sweating, treats skin damage, relieves rheumatoid arthritis, accumulates capillaries and tissues, coagulates blood, acts against drops hair and skin, skin pimples, helps with worn-out joints, gout, regulates cell renewal and acts antiseptic and antibacterial. One strain extract is sufficient for about two weeks of use. For best results it is recommended to use it for at least two months. Adults and children older than 12 years: an effective daily dose of 1 ml (25 drops) three times a day diluted in water or juice. For children between the ages of five and twelve, half the adult dose.